November 15, 2018 (Tony Cartalucci - NEO) - With Damascus and its allies firmly in control of Syria's largest cities and the vast majority of Syrian territory west of the Euphrates - not only has the US-led proxy war against the nation failed - with Russian and Iranian forces involved indefinitely - the return of additional territory under Damascus' control seems all but inevitable. However, the US still holds territory east of the Euphrates, and - as American policymakers like to gloat - much of Syria's oil wealth falls within this territory illegally occupied by US troops. There is also the northern city of Idlib and surrounding countryside - the future of which is still nebulous due to the presence of Turkish forces and Ankara's ever-shifting agenda and alliances. Each side involved in the proxy war has pursued a number of policies - diplomatic, political, and military in nature - to strengthen their positions before the war finally concludes. For Damascus, Russia, and Iran - decisive military victories across western Syria have served as the central pillar of Syria's victory over the foreign-backed militancy. Diplomatic efforts both within Syrian borders and beyond them continue and also play a significant role in ending the war in all of Syria's favor - even including many groups involved in opposing the government now being offered amnesty and reconciliation. The United States - stretched by global wars of aggression, decades-long military occupations, and significantly diminished geopolitical clout - finds itself depending more on political ploys than producing any meaningful military or diplomatic leverage. The repetitive nature of such ploys feeds into a circular process that both exposes Washington's impotence and serves to exasperate it. Despite this - Washington and its many functionaries across political, diplomatic, and information spheres - continue feeding into this process. Thus, while the US still has forces in Syria, and continuously seeks to not only sabotage peace in Syria - but infect Iran with the same strain of proxy war - patient persistence by Damascus and its allies will see to Washington's complete failure both in Syria and the wider Middle East. As America's proxy war in Syria continues to unravel, Washington continues to seek what leverage it can. This includes headlines flooding news cycles attempting to blame the bloodshed in Syria on the current government headed by President Bashar al Assad, and depicting Damascus as ruled by a "brutal regime." Washington hopes to poison the Syrian government's image to the point that any political settlement involving President Assad's continued rule is unthinkable. Yet, with each ploy, the US and its allies simply reaffirm that not only was the opposition in Syria manufactured abroad as was the war they helped trigger in 2011, so too is the humanitarian component of America's pretext for remaining involved in Syria. The Independent's article, "The brutality of the Syrian regime must be told," is an apt example of this. The article is written by Amina Khoulani - founder of "Families for Freedom" - one of many UK-based fronts posing as human rights advocacy groups - but is in reality just one of many components in the West's propaganda war against Syria. 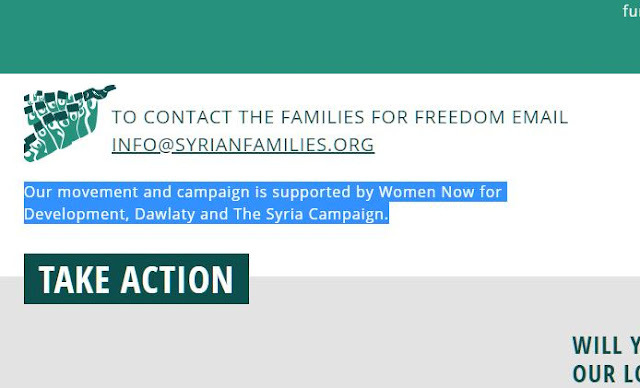 Families for Freedom's website admits it is "supported" by Women Now for Development, Dawlaty, and The Syrian Campaign (PDF) - all in turn funded by Western corporate-funded foundations and the very Western governments who conspired to overthrow the Syrian government and were complicit in arming and funding militants sent into Syria to do so. In reality - even by the US State Department's own admission - terrorist organizations like Jabhat Al Nusra were already active in every major Syrian city - including Khoulani's - by the end of 2011. Syrian forces were not rounding up peaceful activists and bombing protesters - they were fighting armed terrorists and arresting those providing them material support. The abuse of human rights advocacy illustrated by Khoulani's propaganda campaign served a central role in the Syrian war since it began in 2011. By Washington's own admissions, the proxy war against Syria was planned long before 2011, with militant groups groomed, armed, and funded as early as 2007. The 2011 "Arab Spring" was likewise planned and prepared for years before it finally "sprung." In essence, it was the United States and its allies who committed premeditated crimes against humanity - engineering a destructive war that has consumed all of Libya and much of Syria since 2011. Through the use of the West's still potent media monopolies - public perception is still being shaped to believe that the victims of Washington's serial acts of armed aggression are actually the perpetrators - that governments fighting backed against foreign-sponsored armed extremists are "brutal dictatorships" and terrorist organizations and those supporting them are "activists" and "freedom fighters." Articles like Khoulani's appearing in the Independent seek still to shape public perception, to wring whatever leverage still remains from an otherwise tired, battered, and abused "humanitarian" pretext. By continuing to expose these "human rights advocates," who funds them, and to what end, it may be possible to protect the legitimacy of genuine human rights concerns and how the former poses as the greatest danger to the latter. 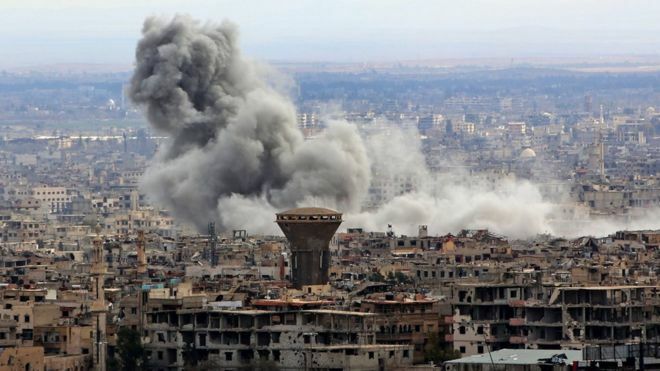 For the Syrian conflict, as it reaches its conclusion we can expect the US to continue rolling out political ploys particularly in the form of propaganda couched behind "humanitarian concerns." Barring any drastic and risky military escalation - the US has few other cards left. Its "humanitarian" card is unlikely to wrest concessions in Washington's favor and the continued, repetitive abuse of this card only further undermines this ploy elsewhere it is used by American policymakers.